Andrew Kennedy always knew he belonged on the land. He wasn’t originally from a farming family – his father was a military doctor – but he got involved with farming as a teen and never looked back. He says that he always loved animals and dreamed of someday owning his own flock of sheep. Fast forward to 2010: Andrew graduated from the New Entry Farm Business Planning Course, which helped him refocus his commitment to farming during a point of transition in his career. Soon after completing the course, he joined Temple-Wilton Community Farm in Wilton, New Hampshire to take charge of managing the animals and farm operations. Temple-Wilton, established in 1986, was one of the country’s first farms to use a community-supported agriculture model. The farm’s CSA model is an unusual one: rather than purchase shares just for a grow season, members buy 12-month memberships and can access the farm any time. Instead of receiving a weekly basket of vegetables they may not like or know how to use, members are encouraged to take only the produce they want and need, while leaving enough for others. The trust and honesty the farm fosters with its members contribute to a profound sense of community. Their slogan, “Growing Food in Community”, is something that resonates deeply with Andrew, and is part of what drew him to join the team at Temple-Wilton. Andrew is involved in all aspects of the farm’s operations, but has a special affinity for working with animals. When he first came to the farm in 2012, Temple-Wilton had just a small dairy of 10 cows and a few hens. Since his arrival, they’ve grown to care for 400 layer hens, 1,000 broiler chickens, 21 ewes, 35 cows and calves, and pastured pigs. They are currently in the process of building up their dairy and sheep herds. Andrew says he wouldn’t call himself just a “pig guy, or cow guy, or chicken guy” – he loves working with all the animals. Working with animals means he uses his expertise every day for land conservation and pasture management. He possesses a deep knowledge of the synergy between his animals and the land, describing the intricate dance of moving animals from pasture to pasture, and understanding which species to graze first to in order to prevent parasite infections in his herds. He says pasture management is a lot like cooking – it helps to have a recipe to follow, but he often relies on his intuition to respond to what’s in “the pot of soup”, keeping his finger on the pulse of each species and what it needs. Despite being the “animal guy”, Andrew wears many hats. One of the things he appreciates about his time with New Entry was the emphasis on what he calls the “nitty gritty” aspects of the farming business. “If you aren’t paying attention to the books, income, and expenses – you’re never going to make it!” New Entry helped Andrew hone some very practical skills, and he came away from the course with spreadsheet templates that he’s now customized to fit his operation needs at Temple-Wilton. 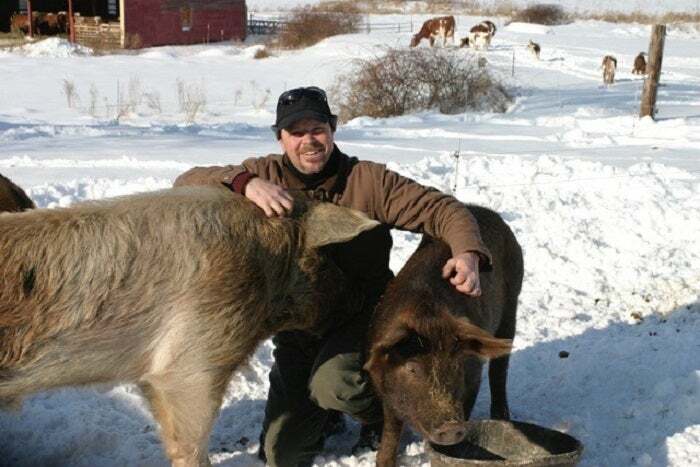 Despite having farmed for many years and developing an expertise in animals and land management, New Entry was significant in helping him strengthen his business and bookkeeping skills, in turn solidifying the farm’s position in the Wilton community. In addition to CSA produce shares, Temple-Wilton also operates a farm store where non-members can come for produce, eggs, milk and yogurt. The Hilltop Café inside the old farmhouse invites folks to sit, enjoy home cooked meals made with farm ingredients, and look out over the pasture. Temple-Wilton does not offer formal tours of the farm, but they welcome visitors to meet their farmers and animals, and will answer questions that people have. The entire 130-acre farm is held in conservation easement, meaning it is permanently protected for agriculture, something that is important to Andrew at a time when American farmlands – and farmers – are quickly disappearing. Temple-Wilton takes on apprentices every year in an effort to teach young farmers the ins and outs of managing a farm. The ability to delegate is another skill New Entry taught him. Though they may want to, farmers can’t do everything; New Entry helped him better understand the value of a good manager who can assign tasks to hired workers – or in this case, apprentices. This year, they have three apprentices learning how to grow produce, two being trained in dairy and pasture management, and one working closely with the farm’s cheese and yogurt maker. Eventually, when Andrew and his partners retire, Temple-Wilton’s ownership will be transferred to these younger farmers so that its legacy can live on. Temple-Wilton Community Farm is located in Wilton, New Hampshire, right off of route 101. Andrew says that visitors are welcome to visit the farm any time.